Update: Sentenced to 30 years, here. The government wants 40 years. It isn’t just Minneapolis producing Somali terrorists! They must not have enough “programs” in Portland either. Nearly four years have passed since then 19-year-old Mohamed Osman Mohamud dialed the numbers on a cell phone to set off what he thought was a massive bomb at Portland’s annual holiday tree-lighting ceremony. He expected thousands of those gathered to celebrate at Pioneer Courthouse Square to die and be injured. Instead, he was arrested. The “bomb” was a harmless fake and the Al-Qaida operatives who helped him plan the attack were undercover FBI agents. Today, a federal judge is to hand down his sentence in a hearing that begins at 10 a.m. at the Mark O. Hatfield courthouse. While the government is seeking a minimum of 40 years in prison, Mohamud’s lawyers are asking for 10. It is up to Senior U.S. District Judge Garr King’s discretion to choose a sentence of up to life in prison. For new readers, go here for all of our coverage of the Somali refugee bomb plot case in Portland. And remember! As of August 31st (11 months into the 2014 fiscal year) we have allowed 8,278 more Somalis into the US through refugee resettlement. 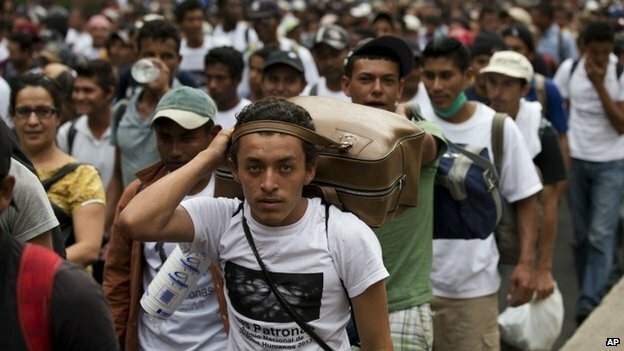 In announcing his ‘Presidential Determination’ yesterday for Fiscal Year 2015 refugee admissions, the Administration set up a new and separate program to accommodate tens of thousands of mostly Central American teenagers waiting in Guatemala, El Salvador or Honduras for their chance to get into the US. Thanks to all who sent this story or a version of it. As you read this ABC News account, remember that expanding the definition of “refugee” has in my view been what the recent Southern border invasion was all about. And keep in mind there are several hundred thousand Central Americans living in the US legally under Temporary Protected Status*** who presumably could, under Obama’s new plan, ask to have minor relatives declared “refugees” in order to join them in America. Under the program, immigrants from those countries who are lawfully in the United States will be able to request that child relatives still in those three countries be resettled in the United States as refugees. The program would establish in-country processing to screen the young people to determine if they qualify to join relatives in the U.S. In a memorandum to the State Department Tuesday, President Barack Obama allocated 4,000 slots for refugees from Latin America and the Caribbean for next year. The number is a fraction of the number of children who have already crossed the border into the United States and are awaiting deportation proceedings. Instead, it aims to set up an orderly alternative for dealing with young people who otherwise might embark on a dangerous journey to join their families in the United States. ***TPS is perhaps the ultimate legal immigration scam because there is nothing temporary about it! The next time you hear a dumb politician or a dumb friend say—“Legal immigration is good, but I don’t like illegal immigration”—I want you to pop them in the nose (gently of course) and tell them they don’t know what they are talking about! Obama has just decreed that this is LEGAL immigration. See all of our coverage of the ‘Unaccompanied minors’ crisis by clicking here. But, I don’t buy it! The numbers will be much higher! The UNHCR has been spouting-off that the US will be on par with Germany in taking Syrians which is 10,000 or more per year! Also, State Department honcho Simon Henshaw said in Turkey recently that our Syrian resettlement will come close to our Iraqi numbers in recent years which is close to 20,000 per year (approximately 68% of the Iraqis we are taking are Muslims)! As you read this article with its several references to 2015, remember FY 2015 begins TODAY! The White House said Tuesday that it has approved permanent resettlement for up to 70,000 refugees worldwide next year, the same figure as for fiscal 2014. Up to 33,000 could be resettled from the Middle East and South Asia, including Syria. Although there is no set target for Syrian refugees, they are expected to form a far larger percentage of the total than ever before. The State Department has received more than 4,000 referrals in recent months and is processing them, a State Department official said. The official, who spoke on the condition of anonymity because he was not authorized to speak for attribution, said “large numbers” of Syrian refugees will begin to arrive in 2015. We are then expected to be grateful to Obama for not setting up a separate Syrian program to bring in even greater numbers which the refugee resettlement contractors must have been clamoring for. Remember the State Department kept the contractor’s testimony secret from the public here in June. The Bhutanese resettlement program which the Bush Administration began will be closed we are told, so there will be lots more room in the regional allotment for the Syrians! We resettled over 8,000 Bhutanese in 11 months of FY2014, here. So we will increase the number of Muslims entering the US because the Bhutanese are mostly Hindus (60%), Buddhists and Christians. Next year, Syrians seeking resettlement in the United States will benefit from the closure of a dedicated program for refugees from Bhutan that has brought tens of thousands of refugees to America over several years. Because all the nations of the Middle East and South Asia are lumped together for purposes of refugee consideration, elimination of special consideration for the Bhutanese gives other applicants from the same region a better shot. More importantly, the U.N. High Commissioner for Refugees has expanded the number of Syrians it screens for resettlement anywhere, including the United States. The UN picks most of our refugees! The overwhelming majority of refugees resettled in the United States are first identified as candidates by the UNHCR. The United States then does its own review. The UNHCR hopes to identify 50,000 for resettlement somewhere next year, and another 50,000 in 2016. The WaPo story mentions briefly at the end that the Presidential Determination released yesterday does not mention Syrians by name at all—of course not! Would you expect any honesty from this White House in the run-up to November elections? Update: Be sure to check the WaPo comments, they are more interesting than the news itself (well almost!). 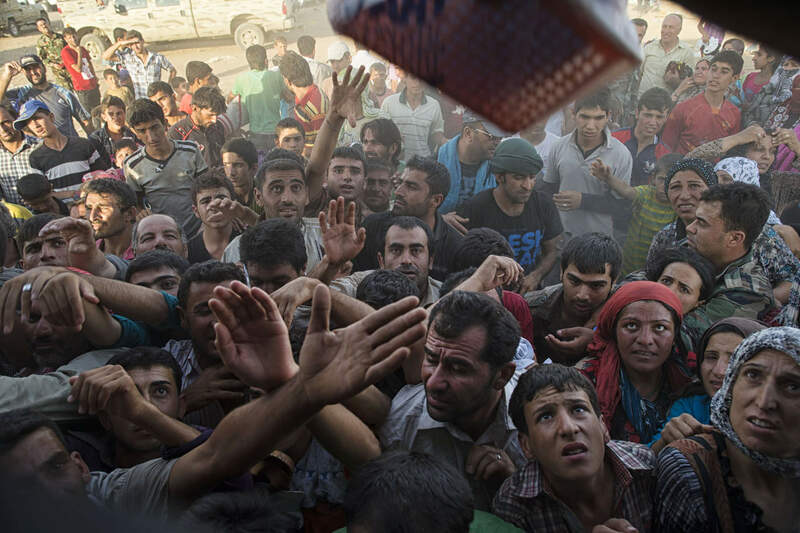 Click here for our very large archive on Syrian refugees. But, the Liberian community of Dallas apparently thinks so. Update October 2: See Center for Immigration Studies on the Liberian Ebola patient—a visa mistake! Let’s send in Senator Jack Reed, Liberian defender par excellence to tell us the full story. Reed was thrilled recently to get Obama to once again extend Temporary Protected Status for Liberians in America who were given TEMPORARY refugee status here over a decade ago for a civil war that ended in 2003 and who should have been sent back to Liberia by now. Kind of crazy that they can stay here longer due to Ebola back “home,” but it seems that we let their fellow Liberians just fly in for visits from West Africa? Can you imagine what the medical treatment of this visitor is going to cost American taxpayers! DALLAS (AP) — The first case of Ebola diagnosed in the U.S. has been confirmed in a man who recently traveled from Liberia to Dallas, sending chills through the area’s West African community whose leaders urged caution to prevent spreading the virus. Stanley Gaye, president of the Liberian Community Association of Dallas-Fort Worth, said the 10,000-strong Liberian population in North Texas is skeptical of the CDC’s assurances because Ebola has ravaged their country. “We’ve been telling people to try to stay away from social gatherings,” Gaye said at a community meeting Tuesday evening. Large get-togethers are a prominent part of Liberian culture. See our health issues category for more on the diseases and other illnesses being brought into the country through the refugee program. Update: It isn’t just Somalis in Minnesota, but apparently UK Somalis don’t feel they have enough taxpayer-funded goodies either as two teenaged Somali girls run off to join ISIS. Powerline blog titles its post—Somalis say: Show us the Money—and then blogger Scott Johnson analyzed a couple of recent news articles where local Somali leaders say they need more night basketball. Just kidding on the basketball thing, but do your remember Clinton pushing taxpayer funded basketball as a way to solve the crime crisis in black communities—in other words it was all about stuff, about more “programs”. They don’t have enough to entertain the youths so the youths take up with Al-Shabaab or ISIS to while away the time. Here is how Johnson begins his post and suggests maybe we should put a halt to all Somali immigration (refugee resettlement which is how most are getting in here). Johnson is just thinking too logically! We’ve got a problem in the Twin Cities that is based in our large and still growing population of Somali immigrants. Somalis have been immigrating to Minnesota for more than twenty years now. They have taken advantage of all the services that our state and local institutions offer. They have been welcomed with open arms, in Minnesota’s characteristic style. Yet Minnesota’s Somali community — a/k/a “Minnesotans” — is the most fertile ground in the United States for the recruitment of terrorists by foreign terrorist organizations in Africa and the Middle East. We are concerned that they may choose to return “home” to Minnesota if they don’t get killed first. What is to be done? Aside from monitoring imams and mosques, the first thought that occurs to me is freezing Somali immigration to the United States. I think this would give us the opportunity to get a handle on the problem while assuring that we don’t needlessly aggravate it. In short, I take it from the two articles devoted to the forum that we don’t have a clue and that nothing useful is going to be done. Read it all. I am so glad to see that other bloggers and the media in general are beginning to report on this lunacy. Of course the US State Department did slow the flow of Somalis to America back in 2008 when they discovered that tens of thousands got in here fraudulently, but the resettlement now is going full steam ahead. The feds and the contractors have too much money at stake in the resettlement process, not to mention the fact that they are cowards! As of August 31st (11 months into the 2014 fiscal year) we have allowed 8,278 Somalis into the US through refugee resettlement. That is approaching the large numbers we saw in three consecutive years under George W. Bush, here. Minnesota got 977 of the 8,278 Somalis resettled in 11 months of fy2014 (here).